The exact invariantOstroumov–Birikh solution of the Oberbeck–Bussinesq equationswhich describes two-layer advective thermocapillary flows in the inclined plane is analyzed. The spectrum of the characteristic perturbations of all classes of the flows is investigated and analytical representations of the eigennumbers and eigenfunctions of the corresponding spectral problem are obtained in the zeroth approximation. 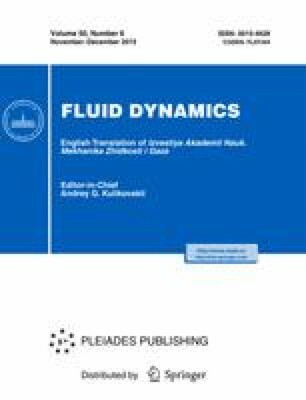 Stability of the flows with respect to longwave perturbations and the possibility of existence of oscillatory regimes are proved. Original Russian Text © V.B. Bekezhanova, A.V. Rodionova, 2015, published in Izvestiya Rossiiskoi Akademii Nauk, Mekhanika Zhidkosti i Gaza, 2015, Vol. 50, No. 6, pp. 3–19.